How To Grow The Perfect Herb Garden (For Serial Plant Killers)! It’s the dream isn’t it? A house with a sprawling back yard, wines on the deck, adorable troop of puppies frolicking around you, and a garden full of edible goodies that aren’t, you know, dead. If keeping a herb garden alive has never quite been attainable for you, you’re in the right place. Here’s exactly how to plant and maintain the perfect herb garden. 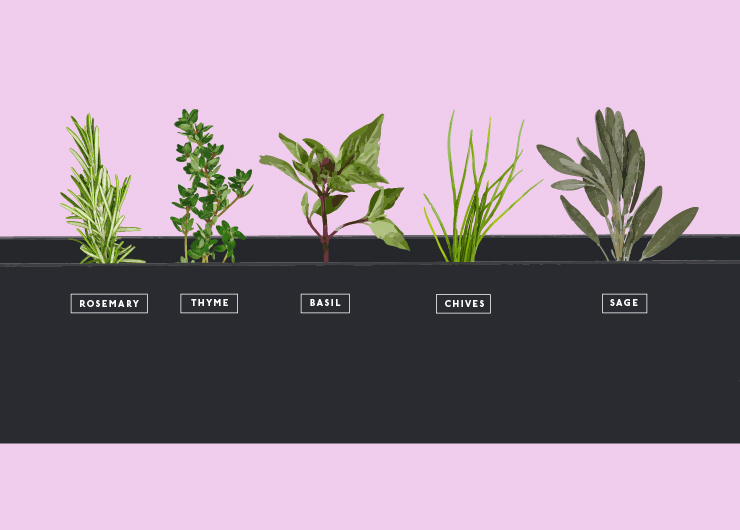 All good herb gardens have one thing in common: variety. It’s also important to think about herbs you’ll actually use, and use often. A good base group to start with is Rosemary, Thyme, Parsley, Dill, Basil, Mint, Chives and Sage. But, obviously your taste is the most important thing; if you’re all about fresh Asian flavours maybe Vietnamese mint would be a better fit than sage #TrustYoSelf. Growing herbs can feel tricky at times (damn you caterpillars!) but, it’s really all in the technique. There’s no real difference, but, tbh, seeds are easier to start off with—they just take longer! Simply pick up a packet at your local garden centre, sow the seeds a few centimetres apart, cover with soil and water and then before you know it, you’ll have herbs everywhere. Herbs are hardy little things, and they can thrive pretty much anywhere. If you fancy a challenge and want to dedicate a specific garden bed to herbs, do it! Or, you can set up a little selection of pots near a window. Just make sure you put your herbs somewhere where they’ll get plenty of sunlight (not too much though, we’re not looking for a charred plant situation) and are safe from birds. If you’re opting with seeds though, garden is always best. With a bit of patience and a little bit of TLC, you’ll have a herb garden to rival Jamie Oliver’s in next to no time at all. Lovely jubbly!